It’s almost time for the big game and to get into the football spirit, Xfinity brought four-time Super Bowl Champion Keena Turner to the grand opening of its new store located on 1068 E. Brokaw Rd. in San Jose. 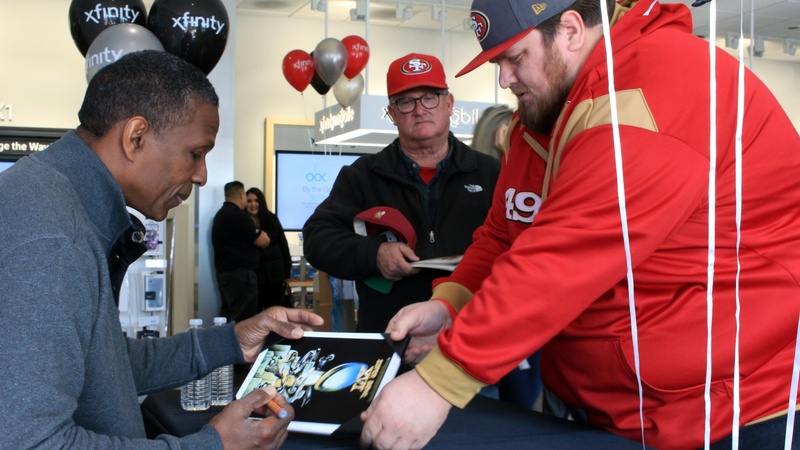 The former 49er player signed autographs and took pictures with dozens of fans who came to check out the new 3,864-square-foot facility located at the Brokaw Plaza. “We recognized Comcast as great business and community investment partners,” said Matthew R. Mahood, President and CEO of the Silicon Valley Organization during the ribbon cutting ceremony on Saturday, January 27. Also in attendance was a representative of councilmember Raul Peralez’ office. The Brokaw store, who will employ 12 staff members, is the third of ten new stores opening in northern California in the first half of 2018. An upcoming third location will open in the San Jose area on 1566 Monterey Rd. that will open on February 10. Visitors at the ten new stores will be able to get a hands-on look at Comcast’s Internet, Xfinity X1, Xfinity Mobile and digital voice, and Xfinity Home products. The former San Jose Xfinity Store on 597 East Calaveras Blvd in Milpitas has closed. In addition to the new San Jose store, area residents can also visit us at our location at Westgate Mall!